Carrie and Ross hear contactee stories involving honey, coat hangers and Christ power, and Ross sows the seeds of discord in the Q&A session. Then Ross listens to former Senator Mike Gravel talk about everything except aliens while Carrie watches investigative filmmaker Jeremy Corbell's forays into Area 51, cold fusion, and alien implants. Plus, a couple of scammers try to sell us cell phone protectors and we get some hot tips on busting chemtrails! Tagged with Mike Gavel, Jeremy Corbell, Whitley Strieber, contactees, cold fusion, alien implants, chemtrails, EMF radiation. 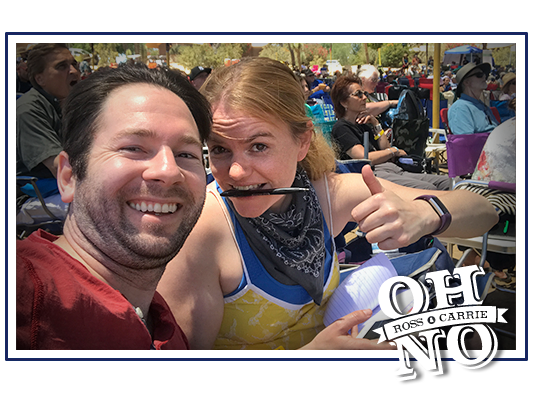 September 9, 2017 by Oh No Ross and Carrie.